mph) and standing-start 10 miles (68.08 mph) were also fast enough to beat the 750 records. His mount became known as "Old Miracle." This machine first appeared in 1912. Jack Emerson, a Norton dealer from Hull, had ridden it the 240 miles to Brooklands from his home. He then set three 500 cc long-distance records (100 miles, 2 hours and 150 miles) in winning the 150 miles BMCRC Senior TT - and then rode home again. 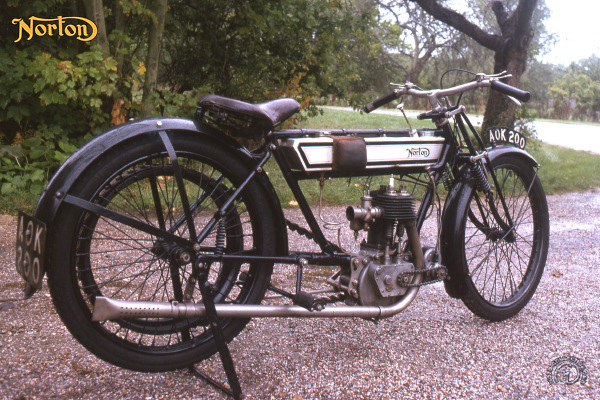 But in 1913, O'Donovan- the brother-in-law of R. T. Shelley, who had bought a Norton in 1912 - found Emerson's bike in a scrap heap, rebuilt it and tuned the engine. Within two months of his first record session, Norton launched the "Brooklands Special" at the London Show, each one guaranteed to have lapped Brooklands at over 65 mph. In April 1914, O'Donovan and his tntsty Norton once again set new flying mile and kilometer records in both 500 and 750 categories - their speed of 81.05 mph for the flying mile was the first time a 500 had officially exceeded 80 mph - and also broke the 500 and 750 sidecar records. Considering that "Old Miracle" was a side-valve single with iron piston and cylinder, direct belt drive and norear suspension, its reco,rds seem even more remarkable. No wonder O'Donovan was better known by his nickname - "Wizard!" In its remarkable career, "Old Miracle" is known to have set no less that 112 world records, ridden by the equally legendary "Wizard" O'Donovan.